A water softener is basically a unit that is used to soften water through the elimination of certain minerals that cause the water to be hard. Whenever there is a large amount of calcium and magnesium present in water, it is termed as being hard. Such water can lead to several problems throughout your home and this is one of the main reasons why Knoxville water softeners are so important. Hard water is known to leave behind water spots, clogged pipes, and complicates detergent and soap dissolving in water. It can also cause scale buildup and in your pipes and water appliances, thereby reducing the efficiency of your water heater. In turn, more energy will have to be used to heat water forcing you to incur more energy expenses. Soap also tends to be less effective in hard water due to the fact that it reacts to form calcium or magnesium soap from the organic acid components found in the products. There are also reports that claim people who bathe in hard water tend to have itchy and dry skin as a result of the soap scum. Hair also washed in hard water tends to have a dull appearance and a sticky texture. By using water softeners, your glassware and silverware will have a much shiner and cleaner look. Water treated with softeners tends to give users hair that is cleaner, smooth and soft to the touch. Using a water softener means reduced housework since it eliminates the formation of soap curd. 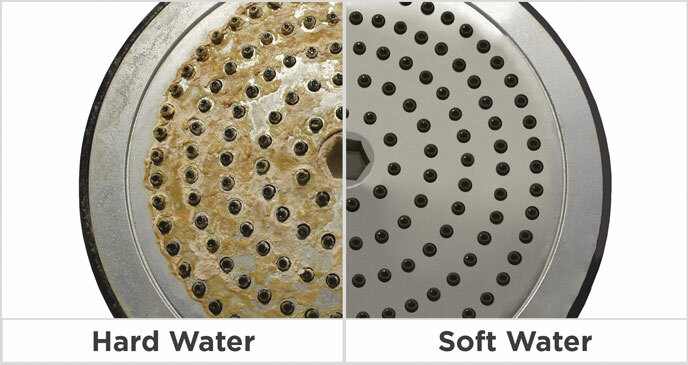 Using a water softener helps restores the rich lathering tendencies of your shampoos and soaps. This can in turn help to reduce costs and usage of these products by around 75%. Fabrics also tend to be softer when they don’t have trapped minerals in them. They also last longer and the whites stay white without the dingy gray that is usually caused by hard water. Using a water softener will basically result in brighter, softer clothes, and also extend their life line. Things such as ice makers, coffee makers, clothing washers and dishwashers are known to last longer in cases whereby soft water is used. In addition, a water heater that uses a softening water system can reduce your yearly energy costs. Reductions rates can be as high as 29%. Using a water softener in your home will help to reduce greenhouse gases equivalent to removing one’s SUV from the road for a year. With all the above benefits, make sure you consider Knoxville Water Softeners.